Interfaces in C# are similar to classes with no implementation. They are the template on the members the class should possess. Thus interface contains the member declarations. Classes and structures implement these members. 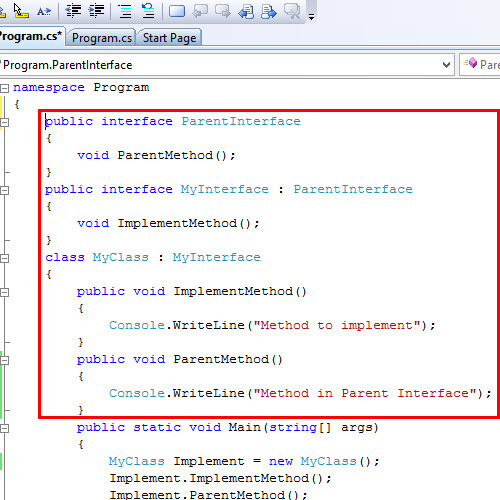 Interface is the standard template you want to implement on the classes that inherit interface. A class can inherit multiple interfaces. Interfaces implement runtime polymorphism. The concept behind the inheritance of the interface in C# is called name hiding. It is the ability to hide the name of the members outside the derived class. You can declare an interface in C# using the ‘interface’ keyword. The interface contains methods that need to be implemented by the class that inherits this interface. Interface can inherit from an existing interface. The class, which implements the interface, must implement all the members of the interface. Consider the following code snippet. It is a two level inheritance. 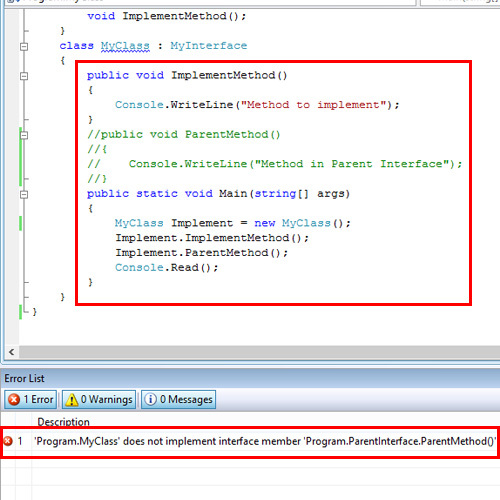 In the first level, the code shows the inheritance of an interface from an existing interface. In the second level, a class inherits the interface. The class that inherits the interface must also implement the members of the base interface. 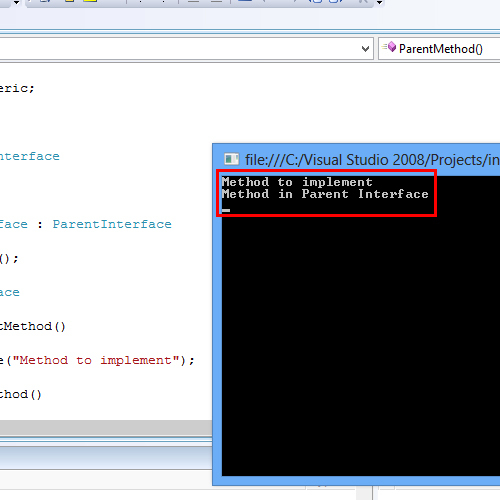 Thus in the preceding code, both ParentMethod() and ImplementMethod() are implemented in the MyClass.